Bel appartement au design élégant disponible pour un séjour à court ou long terme dans le quartier de l'Eixample. L'intérieur de ce bel appartement présente une combinaison créative de différents styles, y compris des éléments typiques de résidences classiques bourgeoises de l'Eixample (moulures sur le mur, balcon) et un mobilier coloré avec un style scandinave moderne. Dans le salon, un confortable canapé fait face à un joli balcon, accessible par de grandes fenêtres. Le canapé divise aussi le salon en un espace lounge avec un grand miroir aux cadres en bois et une salle à manger décorée avec des feuilles naturelles. La cuisine moderne avec ses surfaces en acier inoxydable brillantes, donne directement sur le salon. Elle est équipée de tous les appareils et ustensiles dont vous aurez besoin pour préparer un bon repas tout en profitant de la salle à manger ensoleillée. Les deux chambres sont décorées dans des thèmes différents, vous trouverez une chambre double avec des étagères qui vont plongeront dans une ambiance spa. L'appartement est idéalement situé au centre du quartier, à seulement deux pâtés de maisons de la Plaza Catalunya et de Las Ramblas. Il est également très proche du Passeig de Gracia et de la Rambla de Catalunya, deux des plus célèbres avenues de Barcelone. La proximité de plusieurs stations de métro et de bus offre un accès rapide au bord de mer de Barcelone et au quartier Gothique, connu pour sa vie nocturne. Le quartier se caractérise par un large choix de restaurants, de bars et de boutiques. Hi Vanessa, we are very happy to hear that is your second time staying with us. Thanks a lot for your feedback, we will keep working in order to improve even more. This apartment is very well situated and is close to Placa Catalunya and the Metro stations at Unversitat and Catalunya. The Ronda de la Universitat is a very busy thoroughfare and there is a lot of road noise until late evening. However, the double glazing on the terrace doors is very effective in keeping the noise out but during the day one cant really leave the doors to the terrace open. The living space is roomy but but short of comfortable chairs if you are at capacity. The fold down sofa bed was very comfortable. Whilst we fully expected to provide our own consumables, it would have been nice to have some basic staples like soap etc in the bathroom, a little washing powder for the washing machine and some salt, pepper and sugar. This is after all a tourist apartment, not a full time rental. The sheets were of poor quality when compared to those provided for nearby apartments that our friends were staying in. Bathroom lighting very poor as one of the bulbs has been removed \"to be kind to the environment\". Overall we were happy with our stay but a little attention to detail would make this apartment great. Hi David, we appreciate your feedback and for sure we will take note of the little details in order to improve our service. Glad you enjoyed your stay. Best wishes! Tutto abbastanza bene, luminoso, vicino al centro, ai servizi e ben collegato. Comunicazioni con l\'agenzia veloci, un po meno la risoluzione di alcuni problemi. All\'ingresso la pulizia lasciava a desiderare. Infine un po\' rumoroso di notte il vicino al piano superiore..ma dopo un po ci si fa l\'abitudine! Ottima posizione, casa in centro comoda per raggiungere ogni posto. L\' appartamento è grande, funzionale, manca in qualche dettaglio. Great location and spacious! loved our stay in Barcelona. nice apartment, rally felt at home. barcelona-home was a really good help. Hi Mads, I am so happy that you felt like home here in my apartment! Hope to see you back in Barcelona soon! Superbe appartement, accueuil de qualité. Je le recommende fortement ! Vi var jätte nöjda med lägenheten, den var fräsch och läget var perfekt, nära till allt! La localizacion del piso es perfecta, pasamos na estancia maravilhosa en Barcelona, tabien gracias a este piso. Esta muy cerca de la Rambla, casco antiguo y por supesto la vida nocturna de Barcelona. El piso era limpio y comodo. Gracias! I'm so pleased with my stay in Barcelona and a lot because of this flat. The rooms were cosy and comfortable, but above all, the location of the flat was optimal I think! 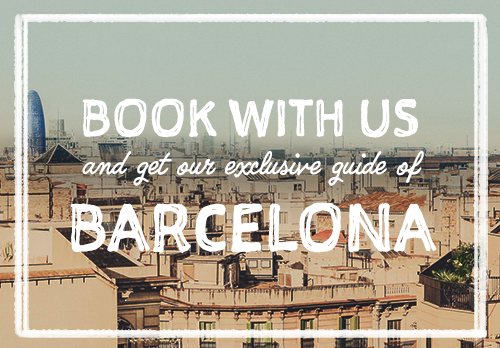 It was situated near Plaza Catalunya, Las Ramblas and a lot of restaurants, bars and more. The service was good as well, so thank you barcelona home for a great stay! We had a lovely time in Barcelona! It was great to live so close to the Rambla, it is such an interesting street! The living statues is a must! Hope to be back soon. Thank you for a good stay! Hi Kyra, it was also great to have you here. Just let me know when you are going to plan your next trip and we can arrange something! Best wishes. central and clean, maybe a bit big for me as it was just me and my dog. it was hard to find green places to take the dog close to the house, but instead there was many good shops and museums. The location can not get any better than this! This beautiful flat was located in the heart of Barcelona and close to Plaza Catalunya, so i was very happy, there was also many bars and restaurants and the staff was friendly with me.